Thursday Moda #22 and a Throwback Thursday in Gold. Welcome to a brand-new Thursday Moda. So, originally I had planned to have a very special Mommy+Daughter post today where we would show off two Gorgeous Dresses we both wore earlier this month while vacationing in the Riviera of the Midwest (click on that link to see what I mean). But I have had an incredibly busy week both at work and at home.A week from today is my last day of work until August 22nd. And next Friday my sister-in-law makes her first ever trip to USA to visit us. So my hands are full to say the least. And I rather sleep whenever I can. I have had no time to edit the new pictures, prepare the post, etc. Instead, I am doing a Thursday Throwback post looking back almost exactly a year ago with my Favorite Outfit/Favorite Dress from July 2015. My favorite outfit of July 2015 that I posted is this Burn-Out Golden Silk Halter Dress that I wore to celebrate my 10th wedding anniversary with my handsome husband (pictured above). It is fitting to post this outfit today, since I miss my husband who is currently out of the country, for work. I paired my Beautiful, Elegant Dress with Black Lace Bow Peep-Toe Pumps that have little Kitten Heels and did some tiny Pattern Mixing with my Leopard Clutch. I straightened my hair completely. Let me tell you, I would wear this dress and this outfit head to toe without thinking twice. Gold+Ivory Floral, Babydoll Halter Silk Dress: Arden B (similar, Steal), (gorgeous option in bright mustard, on Sale, my Favorite), (similar), (similar, Splurge). Leopard Envelope Clutch w/ Buckle & Black Metal Chain: Marshalls (similar, Steal, love this), (similar, Great Deal), (similar, Splurge). Dainty Gold-tone Earrings w/ Cubic Crystal, 4-Colored Stones: Fred's Jewelry (similar in coral+pave, Steal, love these), (gorgeous option, Splurge, my Favorite). Gold Leather Strap, Square Watch w/ Pave Rim: Kohl's (similar, Steal), (similar rose quartz option, Splurge, my Favorite). Marble Coral Cocktail Ring: A Local Beach Attire Boutique (similar, Steal), (similar, Splurge). Black Satin & Floral Lace, Bow, Open-toe Pumps: Payless (similar, Steal), (similar, on Sale), (similar, Splurge, My Favorite). 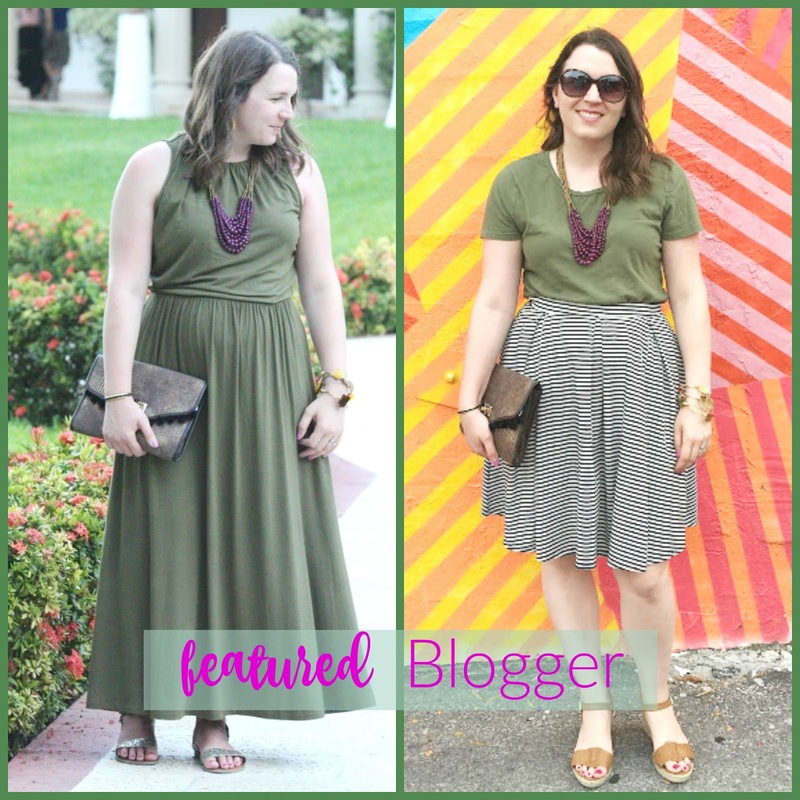 With the magic number of 100, obviously there were many gorgeous looks in last week's linkup. 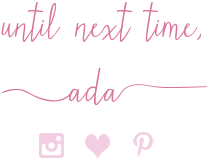 I actually saved the photos for the Favorite Looks collage but like I said I am running late and trying to get some sleep (rather than blog) tonight, so instead I have just the Featured Blogger today. Today's Featured Blogger is BECKY from By BMG who is mom to a little boy, as well as a housewife whose blog I only discovered this year but truly enjoy for its variety. Nina linked up both this Jersey Olive Maxi Dress that she wore on vacation, as well as this Olive Tee + Striped Skirt from her Instagram roundup. It is no shock I picked Becky as the blogger to feature today, because besides liking both of the outfits she linked up for being chic yet half-casual, mom-friendly and Summery, both outfits feature Olive Green - a color I love and for more of that stay tuned for next week's Thursday Moda - and this lovely lady featured today has a bit of remixing going on in her outfits with her patterned clutch and eggplant beaded necklace. Both times she also chose Neutral Cognac Sandals. 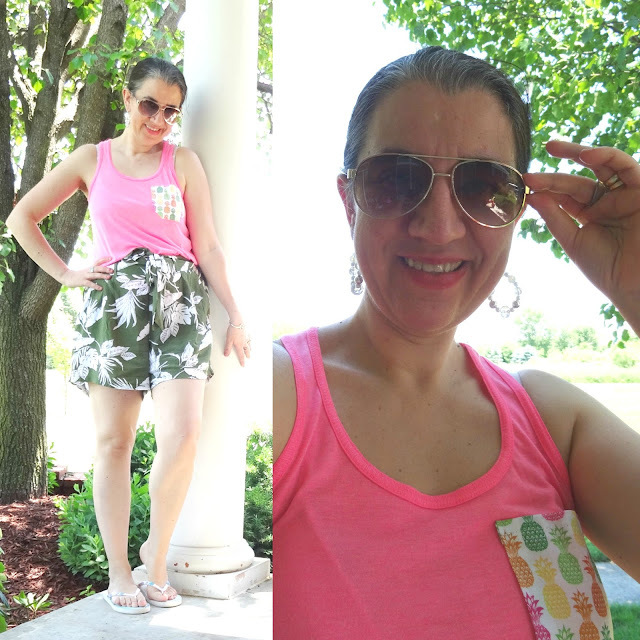 Becky started a very fun "$10 at Target" series which she turned into a monthly linkup. On Fridays she also posts her " High Five for Friday" posts, so there is a lot to look at and admire when visiting her blog, not just her great mom style. Happy Hump Day Loves! I know this comfortable, lay-around, tan and play-at-the-pool outfit is just simple shorts, a tank top and flip-flops but hey I got Neon Pink on and I got some small pattern-mixing going on. The Bright Pink Tank has a pocket attached on the front chest area and a fun bow on the back which are in a multi-colored pineapple pattern. The Olive+White Shorts are in a tropical palm print. And my White Flip Flops are in an aztec print. I added some Fun Earrings and of course Sunnies and it all got pulled together. This Tank Top is from Pumps and Pushups when they sold regular clothes, since they now only sell active wear. Though you haven't seen it on the blog before I have worn it a few times and even packed it with me to vacation. And these shorts I purchased last August, packed and wore them later in August for our Summer vacation. Keeping it short and sweet today since I have a long busy day of work ahead. What are you up to? Neon Pink Racerback Tank w/ Pineapple Pocket + Pineapple Bow on the back: Pumps & Pushups (New) (similar simple option, Steal), (fun bow back tank in red, Fantastic Deal), (similar), (similar dressy option, Splurge). 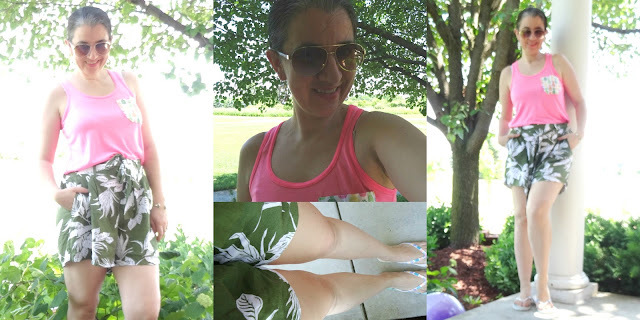 Olive Green Soft Shorts w/ a White Palm Floral Print: Old Navy (similar, Steal), (similar, Great Deal, love this), (similar, Great Deal). Brown Ombre Aviator Sunglasses: Rayban (almost identical), (similar, Great Deal, love these). (similar, Splurge). Yesterday, I shared my Summer Bucket List. I have some great ideas in there but I would love for you to read it and let me know what you think. =) Thanks. Last but not least, I will leave the InLinkz code for you at the end of this post (for your convenience). Come back to link up here tonight at 8.00 PM Eastern time. A brand-new outfit and Thursday Moda post will be up tomorrow morning.